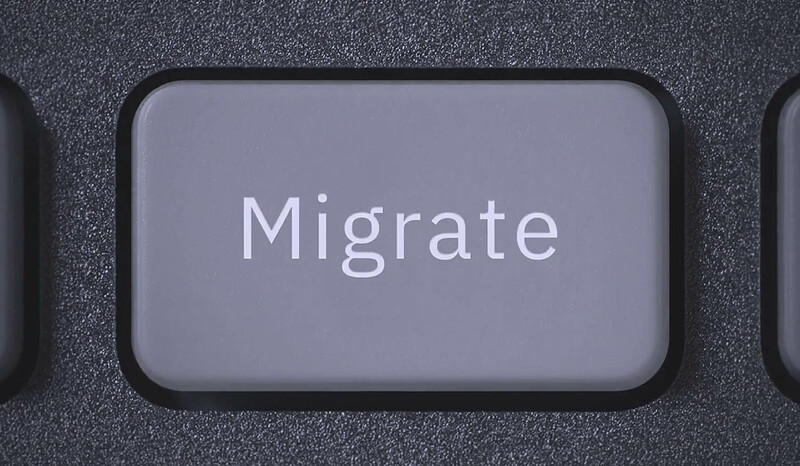 Simplify the migration of VMware workloads from on premises to the IBM Cloud. Try it with the single-node special offer to migrate and modernize your VMware workloads today. What’s new with IBM Cloud for VMware? IBM Cloud™ was awarded the 2018 Global VMware Partner Innovation Award. Seamlessly optimize, expand or migrate your VMware workloads to high-performance, global cloud resources. Bring your VMware environments to the public cloud. Explore four key steps in planning a successful cloud migration. IBM Cloud™ for VMware Solutions can make cloud adoption faster and easier, helping enable you to optimize the value of your existing on-premises infrastructure, while confidently leveraging the same tools, technologies and skills in the cloud. Gain rapid scalability, deployment in more than 60 global data centers and access to best-in-class disaster recovery, backup, security and compliance solutions from an array of ecosystem partners. Easily scale workloads with IBM Cloud data centers located across the globe in North America, Asia Pacific, Latin America and Europe. Take advantage a strategic partnership between IBM and VMware of over 10 years and let IBM experts extensively trained in VMware solutions simplify your journey to cloud. IBM Cloud offers multiple deployment options to provide you with choice and control over your infrastructure, down to the hypervisor level. This customizable virtualization service combines the VMware-compatible bare metal servers, hardware components and licenses needed to help you build your own IBM-hosted VMware environment. This solution automates deployment of the underlying VMware vSphere and VMware vCenter Server layers needed to build a flexible and customizable VMware solution that fits your workloads. Read how American Airlines automated migration of key customer-facing applications to cloud using VMware HCX on IBM Cloud, cutting migration time by six months. Learn how MediStreams extends its VMware environment to IBM Cloud, delivering hosting solutions with accelerated deployment times for its healthcare customers. Dream Payments provides card payment options to small and medium businesses, where data security and data sovereignty are critical. See how IBM Cloud for VMware Solutions is helping enable Dream Payments to evolve from a mobile payment company to a mobile payment cloud provider. Interested in learning how hybrid cloud adoption can help your bottom line? See how simple it is to define the total cost of ownership with the TCO calculator. 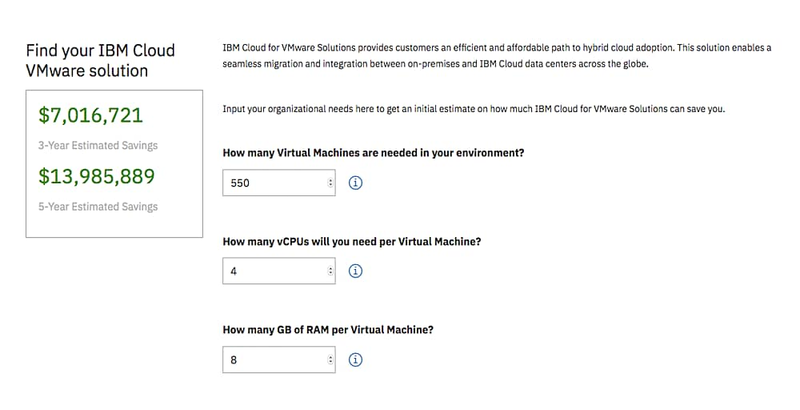 Simply enter a few key variables; the TCO calculator computes how much your company can save by adopting an IBM Cloud VMware solution instead of a comparable on-premises environment. You can even see projected savings over the course of years. Veeam provides automated backup, recovery and replication solutions designed to keep your company running and your data protected with 24x7 availability. Protect, expand or migrate your existing VMware vSphere and other hypervisor workloads onto the global, high-performance infrastructure of IBM Cloud. Protect your workloads with the power of IBM Cloud, VMware Cloud Foundation, HyTrust security software and Intel TXT-enabled hardware. Migrate traditional applications to IBM Cloud unchanged, then modernize them with cloud-native architectures and agile development methodologies. VMware Horizon on IBM Cloud offers a fully managed, end-to-end virtual desktop solution. Provision a data-protection-and-availability solution to an existing or new VMware environment. Seamlessly move VMware workloads to the IBM Cloud using the F5 platform, trusted for its performance, availability and security. Bring on-premises security policies to IBM Cloud for VMware Solutions with a rich set of virtualized and physical next-generation firewall functionality. Easily connect your on-premises environment to the IBM Cloud to achieve a multicloud architecture. With VMware Cloud Verified, you can have confidence in your move to the cloud, knowing you have easy access to the full set of interoperable VMware Cloud infrastructure capabilities delivered as a service. Experiment with the low-cost starter configuration by migrating and modernizing your VMware workloads on the IBM Cloud.